Image caption Inspectors found behaviour at the school was "improving" but was "far from good"
A school in special measures which was in Channel 4's Educating Greater Manchester is no longer putting pupils "at risk daily", inspectors have said. 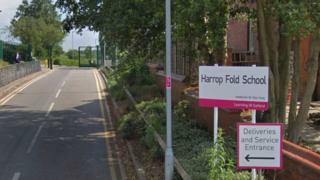 Osted rated Salford's Harrop Fold School as inadequate in all areas in 2018, highlighting safeguarding and misrecording of attendance concerns. An interim inspection in March found the school was now "secure" and records were "now accurate". Salford Council said "the report shows the school is making good progress." The school was placed in special measures in November 2018 after inspectors found "significant and wide-ranging weaknesses", including inappropriate exclusion of pupils and deliberate misrecording of attendance. Head teacher Drew Povey quit two months earlier after being suspended amid concerns over record-keeping. The March inspection, which focused solely on safeguarding, found "effective action" was being taken by interim leaders in the face of "some significant hostility", particularly from some parents. Inspectors found all staff and governors were now appropriately trained and gaps in staff checks have been fixed. The report said that during the 2018 inspection, pupils "showed inspectors how they could freely leave the school premises at any time" and would "freely miss lessons" but the school was now "secure". Inspectors also noted exclusions were being used as a "recognised sanction" and behaviour was "improving" but was "far from good", adding that the curriculum needed revising to "improve pupils' understanding of how to keep themselves safe". It concluded that the new interim head, Claire Wright, "came in to support a school that was putting children at risk daily [and] this is no longer the case". A spokeswoman for Salford City Council said: "We are pleased with the report which shows the school is making good progress." The school will remain in special measures until it has been fully inspected again by Ofsted.